Monsters Ball is another returnee from Halloween last year and I'm so glad it has returned! It's the most cutest looking bath bomb in the range! As the name suggests, Monsters Ball is shaped like a monster, with its one eye and colourful appearance. Once placed in bath water, you're in for an array of colours to greet your bath and it truly looks spectacular. My bath water popped, crackled and the colours changed from being pink, to blue and then finally, deep purple! This bath bomb is very similar to a discontinued Lush Bath Bomb called 'The Enchanter' and contains the calacas scent. These scents - lime, neroli, olibanum oils and also cocoa butter are all contained in the bath bomb. The cocoa butter can be seen in the monsters 'eye' area. This means not only does it leave you smelling great but also moisturises your skin and leaves you feeling completely relaxed. Although the scent is sweet, it's not overbearing and is just right. I adore this bath bomb, for one thing because it's the sweetest thing you ever did see and is too adorable to be scary, but I actually like that the scent of the ballistic isn't too overbearing. The smells were just right for me, and actually I found that it did linger on my skin for quite some time after my bath. I especially loved watching the bath bomb melt away in the bath and see all of the wonderful colours come out of the little monster, along with the hissing and crackling sounds it made a chilly autumn night feel more warming and just perfect. I actually found too, that this bath bomb was relaxing and had me feeling wound down just in time for bed. 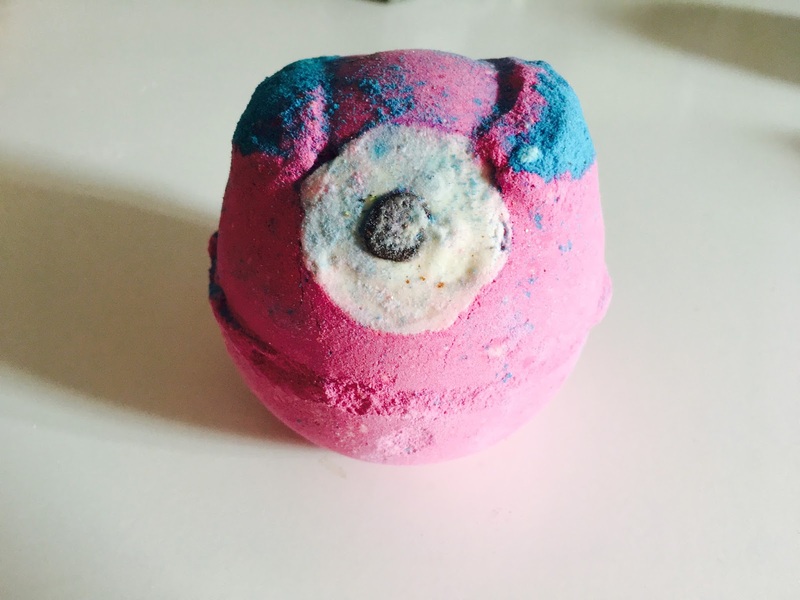 Monsters Ball may not be a strong enough of a scent for some people, however it's well worth giving it a go, at least for the colours in it and for the cuteness of the bath bombs itself! For £4.50 it's not a bad price at all. Let me know if you've tried Monsters Ball? Okay so I can't be the only one who thinks this looks a little like Mike and Sully had a child? Only me? Okay sorry! I love how cute this looks! I've kind of fallen out of love with Lush recently as I find you can get just as nice a bath bomb elsewhere, but I would definitely go back for this one! I know what you mean - it definitely looks like a character from Monsters Inc! I love this bath bomb, the colours are so pretty! It's my favourite bath bomb from the Halloween range!